For the 2005 US counterterrorism mission in Kunar province, Afghanistan, see Operation Red Wings. Operation Redwing was a United States series of 17 nuclear test detonations from May to July 1956. They were conducted at Bikini and Enewetak atolls by Joint Task Force 7 (JTF7). The entire operation followed Project 56 and preceded Project 57. The primary intention was to test new, second-generation thermonuclear weapons. Also tested were fission devices intended to be used as primaries for thermonuclear weapons, and small tactical weapons for air defense. Redwing demonstrated the first United States airdrop of a deliverable hydrogen bomb during test Cherokee. Because the yields for many tests at Operation Castle in 1954 were dramatically higher than predictions, Redwing was conducted using an "energy budget": There were limits to the total amount of energy released, and the amount of fission yield was also strictly controlled. Fission, primarily "fast" fission of the natural uranium tamper surrounding the fusion capsule, greatly increases the yield of thermonuclear devices, and constitutes the great majority of the fallout, as nuclear fusion is a relatively clean reaction. All shots were named after various Native American tribes. weapons development TX-39 primary 40 kt  Mockup of the TX-39. Left a visible Crater off Runit Island, next to Cactus Dome, 600 ft (180 m) in diameter. weapons development TX-15-X1 3.8 Mt  The United States' first air deliverable thermonuclear device. Navigation error landed weapon 4 mi (6.4 km) off aim point (Namu), negated effects data gathering and placing unprotected military personnel facing the blast they had been arranged to have their backs to. The air force identified the test technician that disclosed the miss as Airman First Class Jackson H. Kilgore, for which he was reprimanded. Effects test, but also an international political statement about readiness to drop thermonuclear weapons. weapons development Mk-41 Bassoon 3.5 Mt  First test of 3 stage device. Clean version using lead tamper, 85% fusion; Tewa is dirty version of same bomb. Design evolved into Mk-41, largest deployed US bomb. weapons development Swift 190 t  Smallest (5 in (130 mm) diameter), lightest (96 lb (44 kg)) air defense warhead to date, a boosted, asymmetrical linear implosion device. Fizzled when boost didn't work. weapons development TX-28C primary 14.9 kt  Test of boosted primary for TX-28C (for "clean") thermonuke. weapons development TX-28 primary 13.7 kt  Exploded in a water tank to simulate underground nuke test. Left crater 660 ft × 32 ft (201.2 m × 9.8 m). weapons development 8 kt  Small air defense prototype. A near-minimal diameter spherical implosion system, 11.5 in (290 mm) in diameter. weapons development TX-28S 365 kt  TX-28S (for "salted") test, intentionally dirty high fallout, 73% fission. weapons development Swallow 1.5 kt  Linear implosion, air defense warhead test. weapons development XW-25 1.7 kt  Proof test of XW-25. weapons development XW-45 Swan 15.2 kt  Test of tactical warhead, evolved into XW-45. weapons development TX-28C 1.1 Mt  Prototype of XW-28C. Became the most versatile, widely used design in the US, from 1958 to 1990.
weapons development XW-27 /Zither 1.9 Mt  Same primary as Lacrosse; Prototype of XW-27 warhead for Regulus missile. weapons development TX-21C 4.5 Mt  95% fusion, cleanest shot fired until 1958.
weapons development Mk-41 ? "Bassoon Prime" 5 Mt  87% fission; first US 3 stage device, dirty version of Bassoon tested in Zuni, with tamper change. Developed into Mk-41. weapons development XW-50 ? Proto "Egg" 250 kt  2 Stage thermonuke, XW-50 prototype. ^ The United States, France and Great Britain have code-named their test events, while the USSR and China did not, and therefore have only test numbers (with some exceptions – Soviet peaceful explosions were named). Word translations into English in parentheses unless the name is a proper noun. A dash followed by a number indicates a member of a salvo event. The US also sometimes named the individual explosions in such a salvo test, which results in "name1 – 1(with name2)". If test is canceled or aborted, then the row data like date and location discloses the intended plans, where known. 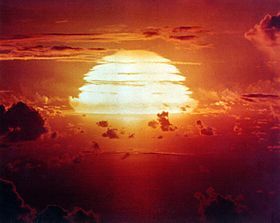 ^ Atmospheric, airdrop, balloon, gun, cruise missile, rocket, surface, tower, and barge are all disallowed by the Partial Nuclear Test Ban Treaty (PTBT). Sealed shaft and tunnel are underground, and remained useful under the PTBT. Intentional cratering tests are borderline; they occurred under the treaty, were sometimes protested, and generally overlooked if the test was declared to be a peaceful use. Wikimedia Commons has media related to Operation Redwing. ^ Blumenson, Martin and Hugh D. Hexamer (1956). A History of Operation Redwing: The Atomic Weapons Tests in the Pacific. Joint Task Force Seven Headquarters, Washington, D.C. p. 19.